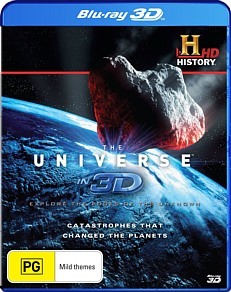 The Universe in 3D - Catastrophes that Changed the Planets Blu-ray Review What a great documentary and that we could happily recommend to all those people with 3D TV's, especially documentary buffs! THE UNIVERSE is an excellent TV documentary series from the History Channel that takes viewers on an astronomical journey through space and time that turn complex theories into easily digestible chunks of information. Using fantastic computer generated images, interviews with experts and dissecting theories by using real-world examples, The Universe is a documentary that can be watched by anyone. Their current release is The Universe in 3D Catastrophes that Changed the Planets that transforms this documentary into glorious 3D that truly enhances the entire presentation. This current release, Catastrophes that Changed the Planets highlights how the universe shaped the planets in our solar system from the barren deserts of Mars to how the rings around Saturn may have been caused by one of its moons. What I liked about this documentary was the stunning use of computer generated images that really made you feel like you are part of something bigger and with the inclusion of 3D, it truly immerses you into this interesting documentary about how the planets of our solar system were formed. The highlight of this documentary for me was the explanation of the rings of Saturn that not only made logical sense but is backed by scientific theory. What a great documentary and that we could happily recommend to all those people with 3D TV's, especially documentary buffs!